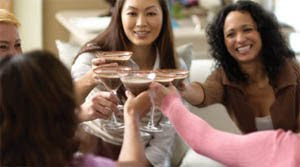 OC Mom Activities: Chocolate Martinis - A Giveaway! I'm very excited to introduce this amazing woman - Kim Sprague. She is a mother of three, who loves doing Chocolate Parties. She is a psychotherapist who gave up the business world to take care of her kids. Her experience with her sons' four year battle with Cancer prompted her to become actively involved in raising funds for Pediatric Cancer and to combat their own large medical bills. Contact her to schedule a home Chocolate Party or if you are interested in becoming a Chocolatier! Valentine’s Day is all about love and romance …well at least that’s what we’ve been told. Marketers have pushed puffy pink hearts, sassy red negligees, and candy printed up with provocative phrases for weeks now, reminding us of that perfect love, that we either have, or don’t. Let’s face it, for many Valentine’s Day doesn’t always end up the way Cupid might have hoped. If you are a lonely-heart, don’t fret. I can help you make the most of St. Valentine’s special day. Maybe you have found the special someone that sets your heart aflutter, but diaper changes and bedtime stories have you too pooped out to celebrate. No worries….I can help you light that fire of love again! Dove has packaged love in a bottle; Dove Chocolate Martini Mix. Imagine decadent, creamy chocolate that can be shaken with your favorite vodka….berry flavors for the wild at heart, espresso or hazelnut for the romantic in you. There are a variety of ways to make a chocolate martini that will reflect your own personality of love. Recently, Dove did an event where they sampled a variety of flavored vodkas with their Chocolate Martini Mix, and hundreds of participants chose pear vodka and pepper vodka as their favorites. Really. What flavors do you think would taste best? I’ll give you a chance to find out! Whether you are planning to gather all your single friends together for a fun night, or you have a certain someone you want to cuddle up with, I have the perfect give-a-way to make the night a success. I’ll ship a, “Girl’s Night Out” kit to a lucky winner. The GNO kit includes a 32 oz bottle of Dove Chocolate Martini Mix, a stainless steel martini shaker etched with the Dove Chocolate Discoveries logo, and 4 martini glasses. Mandatory first entry: Go here then come back and tell us what you'd want to buy! This giveaway will close on Saturday, January 30, 2010 at midnight PST. A winner will be announced Sunday January 31st. If you don't include your email address in your comment, please email it to OCMomActivities at gmail dot com so that you can be contacted if you win. Note that we will need your mailing address on Sunday January 31st to ensure you recieve your Chocolate Martini's before Valentine's Day! Coconut Chocolate Chip Smoothie Mix - that's what I'd like to try! Yummy! I am following "The Chocolate Lady Blog". I am a fan of "Dove Chocolate Discoveries, Independent Chocolatier Kim Sprague". Oh my these all are amazing things related to chocolate. The Sea-Salted Caramel Collection caught my eye as something amazingly delicious. yes please, Mmmm Chocolate is gooood!! I will take one of everything!! I love chocolate but what's jumping out at me are the Sea-Salted Caramel Collection--they look yummy!!! I am a fan on facebook of "Dove Chocolate Discoveries, Independent Chocolatier Kim Sprague"
I would like to try the chocolate mousse starter kit. Yum!! I am following “The Chocolate Lady Blog"
I am a fan on Facebook of "Dove Chocolate Discoveries, Independent Chocolatier Kim Sprague". I would want to buy the Coconut Chocolate Chip Smoothie Mix. Yum! I follow The Chocolate Lady blog! I'd gobble up the almond/cranberry chocolate mix but definitely have my eye on the mudslides as well. I'll be checking out the website more later, I think we need this in stuffy old Virginia! I'm a fan on facebook! YUM! I'm on email feed for OC Mom's Activity Guide! I LUV CHOCOLATE! I would really like to try your Coconut Choc. Chip Smoothie Mix, Choco. Graham Crackers, And Choco Martini Mix! My neighbor Autumn had a party but I was unable to go. I would love to schedule one with you! I follow you on facebook. I would buy the cookbook. Enter me please! by the way your hair looks great!